OF the natives of Central Africa comparatively little is known. It is a large and partly undiscovered territory as yet, but enough of its natives is already known, to pronounce them hardy, brave and inured to dangers which would appall most of us. The population of this vast area consists of numberless tribes, which when not at war with each other, are engaged in the chase, or in one or other of their primitive and dangerous sports. Shooting the rapids of the swiftly flowing streams of their well-watered territory is a favorite pastime. Their boats are veritable shells, and their paddles must be most deftly handled to guide them safely through the sinuous and tortuous waterways. An upset would mean the total destruction of their craft, and more than a mere ducking for themselves, for these rivers have many rapacious denizens, alligators not being the least ferocious. The hippopotamus is hunted in the most ingenious manner. A strong rope is drawn across the road and continued over the branch of a tree overhanging the course the intended prey usually follows. To this is attached a spear head and large weights, and when the brute in passing breaks the cord, the spear with the added velocity of the weights falls upon him and he is easily dispatched. 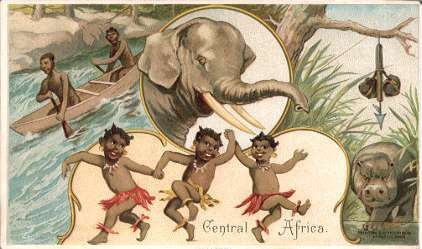 Children of these savages are so agile that they early learn to dance, and decked by the impish ingenuity of their elders, they make the most grotesque figures. Hunting the elephant is very generally practiced. These live in herds of from twenty to one hundred and usually follow some larger and more intelligent leader. Dispersing the herd is rare and dangerous sport. With burning torches they are driven into a pit or trap and dispatched with javelines. The natives are so clever that seldom is one hurt at this precarious pastime.